With a new regime in San Francisco, the 49ers will be looking to install a Seahawks-esque single-high coverage scheme under defensive coordinator Robert Saleh. The 2017 NFL Draft provides the 49ers with an excellent opportunity to revamp their secondary, with 18 cornerbacks and 12 safeties currently sitting in the top 100 on the PFF Big Board. 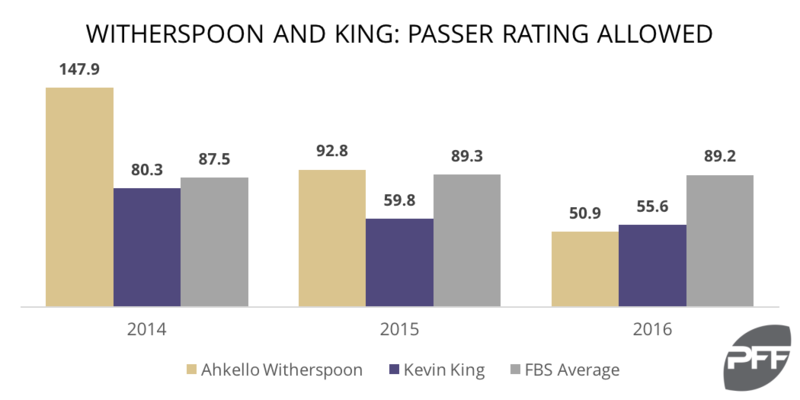 Colorado’s Ahkello Witherspoon and Washington’s Kevin King – both of whom received comparisons to Richard Sherman from the PFF analysis team – would be excellent fits in San Francisco’s new defense if available at the No. 34 overall selection. Both Witherspoon and King saw their passer rating allowed improve in each of the past three seasons, allowing 50.9 and 55.6 passer ratings, respectively, to finish their college careers in 2016.